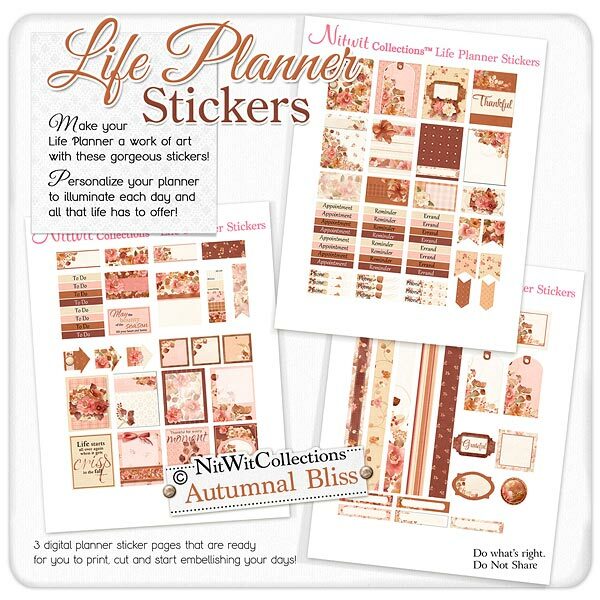 "Autumnal Bliss" Life Planner Stickers welcomes Fall and Autumn with the rich colours and feelings that this Season brings! The floral theme of this digital life planner sticker set is sure to give your pages a sense of tranquility and warmth and the sentiments will inspire your days with all that Fall has to offer! 4 - 1.5" wide box strips...where to put these beautiful tag headers?! 8 - Reminder digital stickers....very useful! 8 - To Do digital stickers for those necessary chores, but also for that night out! 1 - Paintchip style element that would be an excellent bookmark for your latest read! 5 - 7.25" long digital washi tape like elements that will adorn your pages with a large swash of colour and elegance! 5 - Blank writeable tags that allow you to emphasize an important date, quote, phone number or whatever you wish....do it with style! 2 - Jewel buttons to decorate your life planner pages with....how will you use them?? 2 - Square elements that have a space for you to write in or just for decor...they are elaborate enough for this! 1 - Name plate with "Grateful" already written in....what are you grateful for? ?